Syria Daily: Rebels Accept UN Aleppo Aid Proposal — But Will Assad and Russia? UPDATE 1315 GMT: Pro-Assad forces have stepped up their attacks trying to take control of the Hanano district in eastern Aleppo city. Supported by intense bombing, the forces have been pursuing a ground assault all week. Today some pro-Assad sites are claiming significant advances, although others have rejected claims of full control of the area. UPDATE 0645 GMT: The Local Coordination Committees documented 55 deaths in and near Aleppo on Thursday. Most of the casualties were from Russian-regime airstrikes on neighborhoods such as Daret Izza, Shaar, Maysir, #Bab Nayrab, and Qaterji in eastern Aleppo city. The LCC confirmed 106 fatalities across Syria yesterday, including 17 women and 12 children. 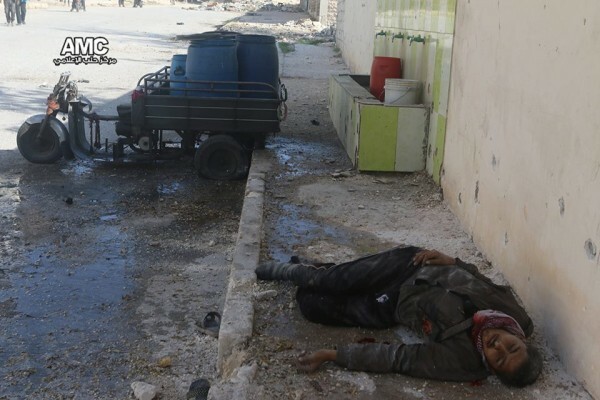 In Idlib Province, 21 people were slain, and 11 died in the Damascus suburbs. ORIGINAL ENTRY: Rebels in besieged eastern Aleppo city have agreed to a UN plan for aid delivery and medical evacuations, but an answer is awaited from Syria’s Assad regime and Russia. The UN’s humanitarian adviser Jan Egeland said on Thursday that hundreds of trucks are ready to deiver food and medicines to an estimated 275,000 people, but 72 hours is needed after approvals to prepare a “big, complex and dangerous operation”. Russia and the Assad regime re-imposed a siege on eastern Aleppo in late August. On September 19, they bombed a UN convoy west of the city, and no further attempts to bring aid have been attempted. The last rations were distributed two weeks ago. 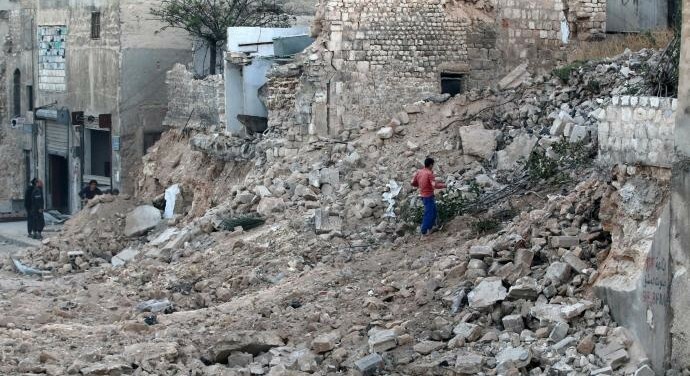 The Russian and Syrian air forces have killed about 1,000 civilians in bombing and shelling of opposition neighborhoods. Almost all of east Aleppo’s medical facilities are out of service. “We want to try to launch a system that could get out of this horrific situation that medical facilities, clinics, hospitals are attacked again and again and again,” Egeland said, adding that hundreds of wounded await evacuation. The Assad regime has refused all UN requests for provision of aid to besieged areas of Syria in November. Earlier this week, UN humanitarian head Stephen O’Brien said almost a million Syrians are cut off, almost all in opposition areas. The head of the White Helmets civil defense organization said on Thursday that residents have fewer than ten days to receive aid or face starvation and death from a lack of medical supplies. The White Helmets are also facing the attacks that have knocked out almost all medical facilities, with their main center in Aleppo damaged. “We have consumed all the stock of first aid kits in our centers and we have consumed all our stock of gas masks. We are concerned that within ten days we may consume all our remaining stock of diesel which is required for the ambulances and the trucks to move,” Saleh said. He added that rescuerss have responded to about ten chlorine attacks in Aleppo in the last ten days. The regime’s head of Air Force Intelligence, Lieutenant General Jamil al-Hassan, has publicly criticized President Assad for being too soft on protesters at the outset of the 2011 uprising. In the time of President Hafez al-Assad in the 1980s, these people were given a painful blow. It was almost lethal, particularly in Hama. I was a young first lieutenant. The decision at that time was a wise one. This time, we did not settle the matter from the beginning, which is why we have ended up where we are. But it was the decision of the leadership. As for me, my view was different. Take, for example, the students at the [Tiananmen] square…, which changed China. If the Chinese state had not settled the student chaos, China would have been lost and the West would have destroyed it. A former key figure in General Intelligence — and in Bashar al-Assad’s rise to power — Lieutenant General Bahjat Suleiman disagreed with al-Hassan, saying Assad did not have the “luxury of experimentation” and had to make tough decisions for which he was not prepared. Therefore the President acted with “a cold mind and a warm heart” to prevent Syria and the surrounding region from turning into “hundreds of terrorist emirates waging war on each other, fighting each other, and butchering each other for a hundred years”. When I ask contacts inside Madaya how they are, response now is always "cold". When I asked what one man was burning, he said "the bedroom". A US special forces member has been killed in northern Syria, the first American combat fatality in the conflict. The soldier was killed by an improvised explosive device near the town of Ayn Issa. More than 300 US special forces are supporting the Kurdish-led Syrian Democratic Forces in a campaign against the Islamic State. Earlier this month, the SDF announced an offensive to move on the main ISIS center in Syria, the center of Raqqa. There have also been clashes between the SDF and Turkish-supported rebels in northern Syria, with possible disputes over territory as ISIS retreats. On Thursday, the Kurdish militia YPG, which heads the SDF, threatened to call off the Raqqa operation if the Turkish-backed rebels move on Manbij in Aleppo Province. The SDF took the city, the main ISIS position in the province, this summer. PreviousPakistan Feature: Who Can PM Sharif Trust as Next Head of the Army?